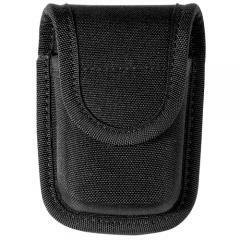 The Bianchi PatrolTek 8015 is a versatile belt-mounted pouch designed to hold either a compact pager or two pairs of latex gloves, making it useful for law enforcement or other first responders. It is made from rugged molded trilaminate, with a wear-resistant 600 denier woven exterior. The top flap improves security and provides all-angles protection, and includes a hidden snap closure to keep it securely fastened. The pouch attaches to the belt for hands-free carry using a sturdy dual web belt loop, allowing it to fit both 2 and 2.25 inch duty belts. Excellent quality. We use them for exam gloves. Easily holds three pair. Nice pouch Holds 2 pairs of gloves. Compact making it more room on your belt. Great product. Just like the accumold product but much cheaper. Holds 4 pair of large nitrile gloves rolled up. what is the size of this for holding a pager 3x2? Holder measures about 3" x 1.5" x .5"